Clayborne’s presents the first revision to our deluxe line of Amish made solid hardwood jewelry boxes, featuring sturdy dovetail joints, and available in a variety of configurations to satisfy the needs of almost any customer. The first revision adds a drawer to the front of the jewelry box, but leaves everything else the same. 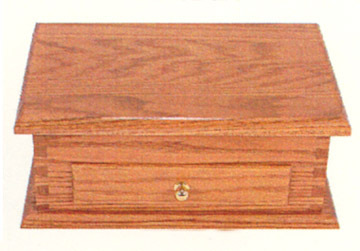 Here is the solid oak deluxe jewelry box with a plain top and a drawer in the front. This jewelry box is also available in solid cherry.